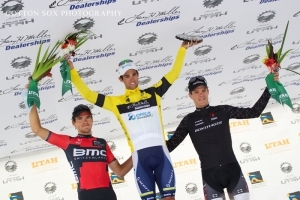 TORREY, August 7, 2013 – The longest stage of the Larry H. Miller Tour of Utah might have been 131 miles long, but Orica GreenEdge’s Michael Matthews only needed a bike length to take the win in Stage Two and slip into the yellow jersey. 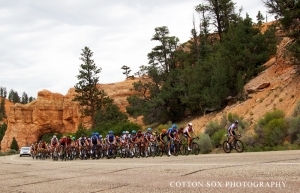 Matthews, second a day earlier in Cedar City, survived the epic journey from Panguitch to Torrey along the scenic Highway 12 byeay and outsprinted BMC Racing Team’s Greg Van Avermaet, winner of Stage One, in the shadows of Capitol Reef National Park. Matthews took full advantage of the time bonus given the stage winner and is now is one second in front Van Avermaet in the overall standings. Matthews now wears the Larry H. Miller Dealerships yellow leader’s jersey. Bontrager Cycling Team’s Jasper Stuyven finished third in the finish. BMC worked hard to limit breakaway threats and protected Van Avermaet and the yellow jersey throughout the stage, but Matthews and Orica GreenEdge turned the tables on the race standings in Torrey by outpacing all others in the homestretch. 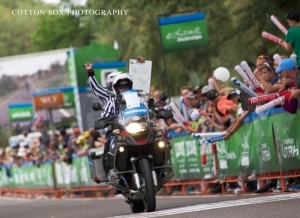 Martin Wesemann of MTN Qhubeka and Michael Hepburn of Orica GreenEdge were allowed to escape from the peloton early on and built a sizable lead of nearly eight minutes before beginning a relentless ascent of Boulder Mountain. The gap quickly disappeared and the peloton was together as the summit neared. Andzs Flaksis (Bontrager) attacked at the summit of Boulder Mountain for KOM points and was allowed to ride off the front until there were just five kilometers left on the long descent into Torrey. Garmin-Sharp’s Dave Zabriskie (USA) attacked with three kilometers to go and soloed away from the field until finally getting caught with just 1000 meters to go. From there, the teams lined up their sprint trains and set the stage for the exciting finish. 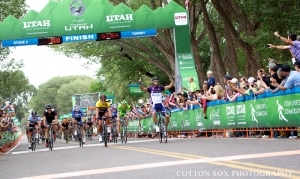 Bissell Pro Cycling’s Michael Torckler (New Zealand) retained his Ski Utah King of the Mountain jersey and Hincapie Sportswear Development’s Ty Magner (USA) will be the Subaru Best Young Rider for at least another day. Though Matthews leads the XO Communications Sprint points race, Van Avermaet will wear the purple jersey on Thursday, swapping jerseys and position in the points classification with the new race leader. Wesemann, the last man standing from the early breakaway, was awarded the Vivint Most Aggressive Rider jersey. 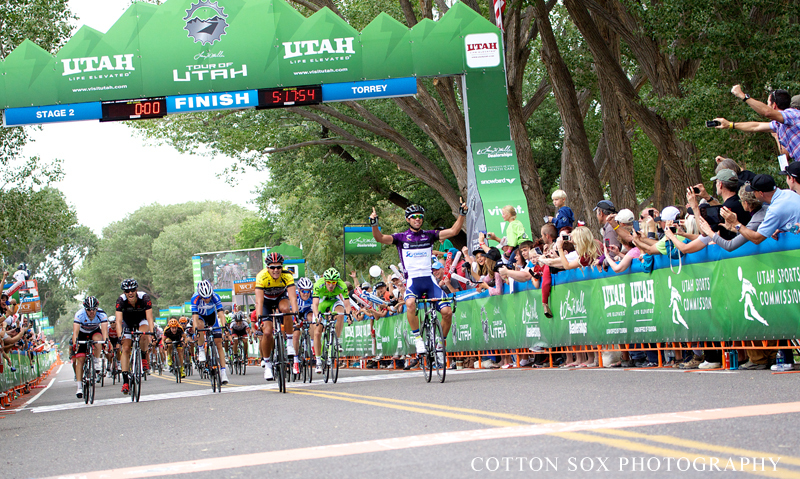 Utahns Jeff Louder (UHC), Connor O’Leary (Bontrager) and Tanner Putt (Bontrager) are each 17 seconds back in the overall standings while Zabriskie sits 53 seconds back. Jamey Driscoll (Jamis-Hagens Berman) was taken out of the peloton by a crash and though he stayed upright is now 1:18 back. Thursday is Stage Three presented by ion shoot/share, a 119-mile ride from Richfield in central Utah to Payson, just south of Provo. 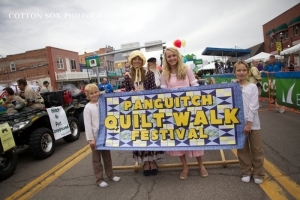 With 6,202 feet of climbing the stage is relatively flat and rolls through the Sevier and Sanpete Valleys before launching into a rugged climb over the Mount Nebo summit which caps out at an elevation of more than 9,300 feet. After reaching the peak, the field heads to Payson where the finish line awaits a sprint among those able to summit and regroup during the 22-mile descent of more than 4,000 feet. Stage Two will begin at 10:50 a.m. The peloton is expected to finish at approximately 3:45 p.m.
All race results are available online at <http://www.tourofutah.com/>www.tourofutah.com.